This show is layered with a small dose of funny. 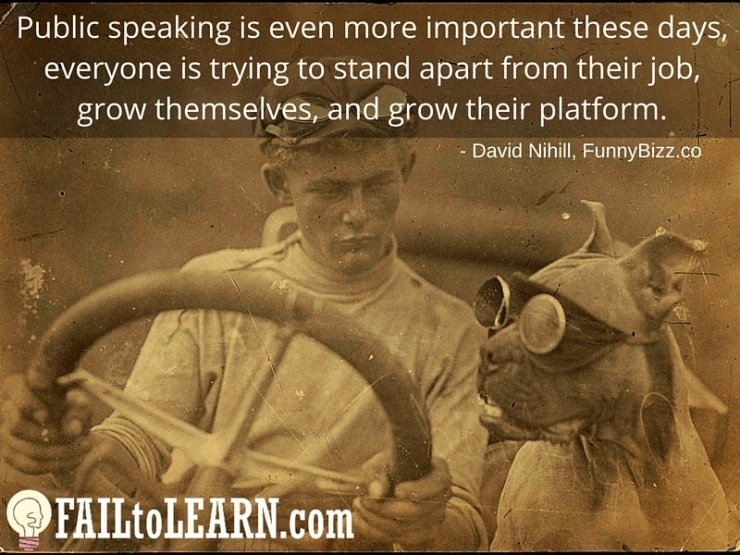 My guest is David Nihill, the author of Do You Talk Funny? 7 Comedy Habits to Become a Better (and Funnier) Public Speaker. When I originally asked David to be on the show he replied saying he didn’t have any business failures to share, but thanks for asking. I didn’t agree with him. David took on comedy to overcome his fear of public speaking. He couldn’t stand in front of a room and talk. That’s a problem many people face. Possibly you? He had to share his story here. So I hit him over the head and drag him into the cave to share his story. What he teaches will help entrepreneurs, CEOs, managers, sales people, coaching calls, and more. Humor makes everything easier. And David makes humor easy. How he fell apart the first time speaking. How fear of public speaking can hold you back at work and other areas of your life. Why David still hates being on camera, and what he’s given up because of this fear. Why he chose stand-up comedy, of all things, to face his public speaking fear. Why he said comedians are the true masters of public speaking. What you can learn from comedians to present better and make more sales. Why stories drive the best comedy, and the best business presentations. How David uses stories with traditional comedy techniques to build his routine. What he took from comedy to apply in business. What you can do to hone the funny parts in your presentations so you don’t have to master the stand-up comedy circuit. Why comedians always watch what they did to get feedback and improve. Why “winging it” is the worst thing you can do when presenting. The two parts of your presentation that you must completely control to be a true master. What “calling the room” means and how you can use it for maximum impact in your presentations. The structure of a joke, and how to use it in your presentations and stories. Why you’re being judged from the first minute of your presentation, and how to start strong. Why he feels slightly guilty for Donald Trump becoming who he is today, because of David’s mother. How to create a “memory palace” to help you remember your stories. The one thing most people can do to feel relaxed and calm before any presentation. Why David hates most public speaking books. How David tested his ideas before writing his book to see if there was a market for it. How comedy improves your ability to write stories. Why practice is so critical. What David does that helps him tweak his creative efforts. Arash Bayatmakou’s Tedx Talk, Little Big Steps: What if you were told you might not walk again?